Friday Finds: November 16, 2012. This week I played with a few beauties that came right from the drugstore - CVS in fact. All of these products are new at CVS/pharmacy this fall, so be sure to check them out there. This super glossy wax free glosses deliver high shine and a ton of pigment. I am surprised at how well these last without being sticky. In 12 colors, they are a bargain and have me wanting to pick up more. This hair powder doubles as a dry shampoo as it absorbs oil in the scalp as it adds volume to the roots. Sprinkle a small amount in your part and by turning your head upside down. Brush hair and watch the wow. It makes my hair looks so much fuller, thicker and full of volume. Hair feels a bit tacky or stiff, which seems make help volume and curl stay in place too. I love Sally Hansen nail polish strips, so these sparked my interest. You apply the strips, then a special gel top coat, and cure it under an LED light to make sure the polish lasts and looks glossy for two weeks. I received a box to try, but I couldn't because the lamp was broken in the box. I have to admit that I am not impressed with the size of the lamp (it's only for one nail at a time), and the nail strips themselves. They are not the same as the nail polish strips. If you've tried these, please let me know your thoughts. Anti-aging products for the hair? You bet! As we age, hair thins. These three products from Pantene's new Expert Collection work together to thicken existing hair, making thinning hair look less noticeable. 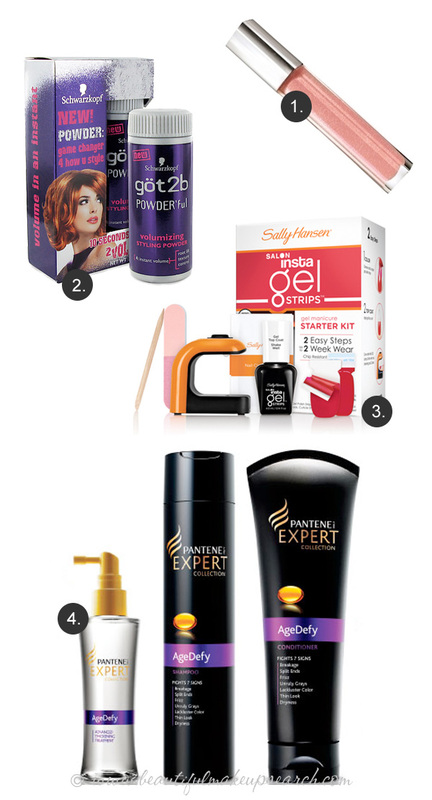 The products include AgeDefy from Pantene Expert Collection Shampoo & Conditioner and a Thickening Treatment.